Welcome to Argassi Heights Apartments! The Argassi Heights Apartments are situated above Argassi on Mount Skopos itself and the surrounding land hosts a traditional Greek mountain church, which the owners are happy to open on request and is available for marital blessings. 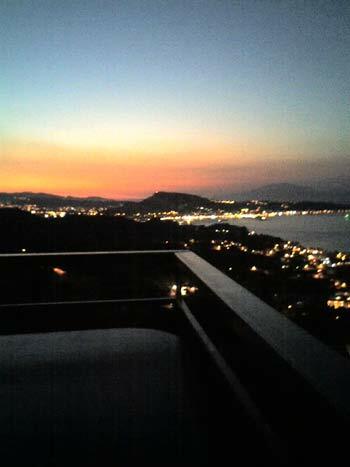 These 2, 2-bedroomed, self-catering apartments and a separate self-contained studio apartment, offer breathtaking views of Argassi, Zante Town and harbour, and across the interior plateau of the island to Akyles, and allow sea views of Kefalonia and the Greek mainland. Evening sunsets are spectacular to view and at night the island below comes alive with twinkling lights. Argassi Heights is the perfect location for discerning visitors who do not wish to stay in mainstream tourist accommodation. Or Phone: Argassi Heights number - in Greece (0030) 698214297. 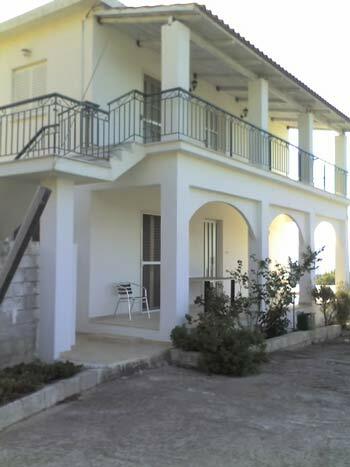 There is ample parking and the apartments are accessed via marble steps that lead onto a balcony, with tables and seating, which overlooks Argassi and Zante Town. Due to this fact and the mountain location young children would need to be supervised; however, the accommodation is particularly suitable for couples, families with older children and groups of friends sharing. Each apartment can comfortably sleep 4 people, with a possibility of accommodating more, as single, double beds and cots are available on request. The kitchenettes are fully equipped,- 2 ringed hob, toaster and kettle, crockery and cutlery, and bed linen and hand towels are provided. An iron and hairdryer are available on request. A ‘welcoming pack’ of essential tea, coffee, water and fruit juice will be in place on arrival, so that the traveller can instantly unpack, relax and enjoy the views. Barbecue facilities are also available for guests to use.